At the age of eighteen, Angela Balcita had reached a point in her life when her health could not keep up with her optimistic personality. After suffering kidney failure and after her body’s rejection of the kidney her brother donated to her, she was in desperate need of a transplant. Lucky for Angela, she had found the ultimate partner in crime: her boyfriend, Charlie. Charlie offered Angela his kidney. The ensuing story is unforgettable, with readers following Angela and Charlie’s journey through preparations for their respective surgeries; the procedures themselves, difficult yet emotionally riveting; the process of recuperation through the relapses; and the eventual healing — both inside and out — that greets this undeniably powerful duo. 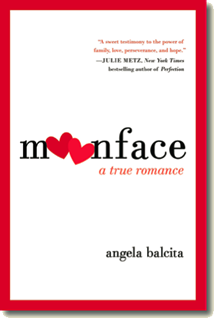 By turns funny, bittersweet, and heartwarming, Moonface will make readers laugh, cry, and, above all, appreciate the importance of unconditional love. Copyright © 2019 Angela Balcita. All rights reserved.